The sale of goods and services from organizations to consumers are a part of a supply chain system management that leads to an efficiency of system regulations. This end user retail chain in the supply services has been facilitated with the use of new network communications to achieve key deliverables that any such organization may want to achieve. The main purposes of using software are to regulate pricing, calculate taxes, inventory management and manage POS, billing, and payroll. Retail software decreases the time expediency due to the challenges of fulfilling large manual billing and thereby makes end sales report easily accessible to determine the future predictions for any kind of business. However, as opposed to general rule it becomes extremely difficult if the chain supply system is unable to match the growing demands of the ever-satisfied customers. 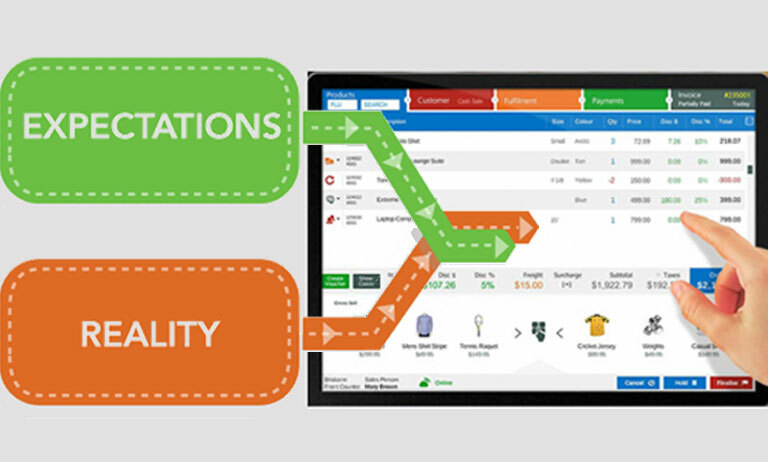 Expectations: Retail POS software is time-consuming and leads to efficiency in the management of resources. Reality: The heavy price tag to deal with such system upgradations from time to time to match the market modules and demands ends up cutting a great chunk from the resources of the company’s management that could have been utilized for more important purposes. Expectations : Automation of data is updated easily making the data collection process simplified with efficient decision making and better future planning based on such information. Reality: The cumbersome work of uploading the files with system crashes in between leads to failure of automation of such data and if the data entered if wrong in any minuscule proportion, this distortion would lead with wrong decisions by the company’s management and all planning would become useless. Expectations : The end-to-end user accessibility makes customer relations more efficient and the retailers are able to cater to the direct needs of the customer based on their preferences.. Reality : The generation of such information by the customer may vary from time to time based on their current choices and market trends and often consumers despite good sales promotion, promotional information, and emailers, etc., lose interest due to excessive customer relation policies. Therefore, a prudent organization has to weigh in the consequences of establishing such software operations and to transform their developmental policies from time to time to be able to understand the demands of the consumer without failing to cater to them. PAIT Systems helps its customers to solve such problems; we are expert in Retail Shop Software, Billing Software for Retail Shop, POS Software India, Retail Billing Software, Hardware AMC and IT infrastructure support in Pune. Our Retail Software is one well-known product, Retail POS in Pune, Retail Software In Pune.